Ya Ya... Download links are also included. 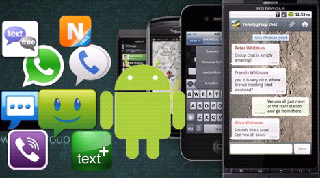 Today , i will post a list of 5 sms apps which are best for sending free SMS (wow!!) from android phones. Best thing, No paid apps (Great, is n't it :), these free SMS apps are meant only for Indian users, but i will post for international users too in future (don't worry). So, Fellow Indians; just read reviews and download whichever app you like the most.... but please do tell me your own view & stay connected. YouMint accounts in one single app.It is available for free in the Google Play Store. Just Login with desired SMS portal and start messaging for free. First official app in my list means its officially supported and updated. It offers many new beautiful features like 470 character SMS’s, bulk sms’s , no ads and delivery reports. 3. Fullonsms - Another official app, Nothing much special about this app but it offers most fastest delivery of SMS (Believe me !!) for FullOnSms. 5. FreeSMSIndia - Last app, Nice app but sometimes buggy , character limit of only 140. Overall a nice tiny app , very small in size.